Buying a turntable for a home theater isn’t unheard of. Although LPs and the turntables that play them aren’t too common, they can be a useful addition. Many audiophiles have long felt that LPs (when played on super-high-quality turntables) sound better than CDs, and a number of artists still release LP versions of their new recordings — so a handful of manufacturers continue making turntables. Belt drive or direct drive: The platter (the thing that the record sits and spins around on) can be spun in two ways. There are pros and cons for each. Belt drive: In this setup, the motor is separated from the platter and spindle and turned by a rubber belt that runs around the outside of the platter. A belt drive tends to isolate the rest of the turntable from any vibrations coming from the motor. On the downside, a belt drive tends to be less accurate than a direct drive in its playback speed, which can lead to changes in the pitch of your music. Direct drive: An electric motor is directly attached to the spindle (the small cylinder that the platter rests upon). Direct drive turntables tend to be a bit more constant in their speed, so the turntable is more likely to turn 33 1/3 times per minute without any speed variations (such variations tend to make your music sound warbly). Some folks, however, feel that direct drive turntables are more susceptible to vibrations. Suspended or unsuspended: Vibrations are a big deal with a turntable because the stylus dragging through the grooves of the LP can pick up extraneous vibrations and transmit them along with your music. 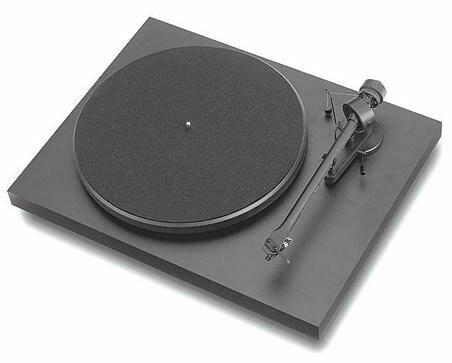 Some turntables have elaborate suspension systems designed to isolate the platter (and therefore the record) from these vibrations, whereas others rely on the user to isolate the entire turntable (by placing the whole thing on a very sturdy rack, for example). Automatic, semiautomatic, or manual: An automatic turntable lets you put a record on the platter, push a button, and listen. The turntable itself moves the tone arm over the record, drops it down before the first song, and then lifts it up and returns it to the resting position when the side of the record is finished. Manual turntables require you to manually move the tone arm over the record and then lower it onto and off the record. Semiautomatics do half your work for you — you lower the stylus onto the record, but when the record side is finished playing, the turntable lifts the tone arm and stylus up off the record automatically. If you’re buying a turntable, think about your needs. Do you have a lot of records that you’re going to play all the time? If so, invest $500 to $1,000 dollars in a nice turntable from a company such as Rega or Pro-Ject. Have just a couple of old favorites you can’t get on CD? Check out some of the $150 to $200 models from Sony or Denon. Want to be a DJ? Consider Panasonic’s Technics brand of DJ turntables.